This is the story of a lone mouse who uses his imagination and ingenuity to fulfill his dream of finding his friends and family that have fled Germany for America. 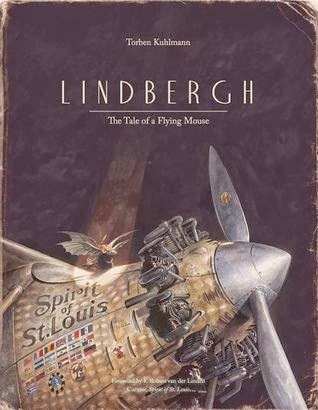 This ingenious little mouse fights a harrowing battle to build his own flying machine after a futile attempt to board a steamer to America. This is the story about never giving up, to keep going through your trials and to learn from your mistakes. It is a wonderful tale to share with your young children, they will be awed by the determination in this one little mouse. I can already see thousands of children running around their yards pretending to fly and escape treacherous evils and taking up a love of aviation all due to one daring little mouse that accomplish the impossible. My only criticism to this book was the writing. It seemed at times that the story was written to the picture as opposed to the picture being created for the story. But then when I read the author's bio it all made sense. He is an amazing illustrator! I can not give enough praise to the artistry in this books pages. The pictures are simply amazing. I would never suggest deconstruction of a book, but I would love to have some of these pages hanging in my daughter's rooms. Because of the artistry and the story they tell I think this is a must have for any children's library. I loved this little mouses journey and the tie in to historical events (no surprise there, lol), the back of the book even has a little section devoted to a short history of aviation. I am going to leave you with this amazing trailer for the book. Again, the artistry is just plain fantastic, enjoy this oh so sweet tale! Where to buy and don't forget to add it to your GoodReads TBR!